Do you need new keys for your car? City Locksmith Services has been providing automotive – as well as business and residential- key cutting services to Drexel Hill, PA for a number of years. We are specialists at key duplication and key replication and we can have your keys cut for you in no time. We can also provide you with new transponder keys or reprogram your old ones at an affordable price. We pride ourselves for providing a high grade of workmanship and quick turnaround times. Until about a couple of decades ago, picking the lock on the door of a typical car was very easy. Thieves were able to enter inside and steal cars without too much of an effort. All that changed, though, with the introduction of transponder keys, which were introduced into the commercial automotive industry in 1995. 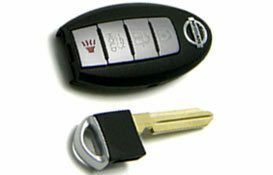 Transponder keys are high security keys that work with a different mechanism than the traditional one, preventing thieves from stealing cars by hotwiring them. How does the transponder key work? So how do transponder keys work exactly? A transponder key is different from a key that can remotely lock and unlock the door on your car. It has a microchip inside it with a serial number unique to that particular key. When you push this key inside the ignition on your car, the unique signal emitted is identified and then deactivates the car’s immobilizer mechanism. The car is then allowed to start. However, if you enter a key with the same make but carrying a different code, the car won’t start. In some modern-age models, the chip on the key changes the code used to start the car every single time it is inserted in it. Even if someone was able to successfully get one code, it won’t help them much as the encrypted codes keep changing. Transponder keys are difficult to make. The chip on them that needs to be programmed also needs a special machine that is expensive and not available everywhere. Also, the blade has to be cut precisely for it to turn in the ignition. City Locksmith Services’s locksmiths are well trained and are technical experts who can make you a transponder key without too much hassle. Unlike with some locksmiths, City Locksmith Services can make you transponder keys or reprogram your old one in as little as 30 minutes. If you need a transponder key made, call us today on 610-235-0675!